NOVAK Djokovic is out of Wimbledon after retiring hurt during his quarter-final match against Tomas Berdych. An upper arm injury forced Djokovic to abandon his Wimbledon campaign midway through the second set against Berdych. The three-time champion retired while trailing the Czech world No. 15 and former finalist 7-6 (7-2) 2-0 on Court 1. 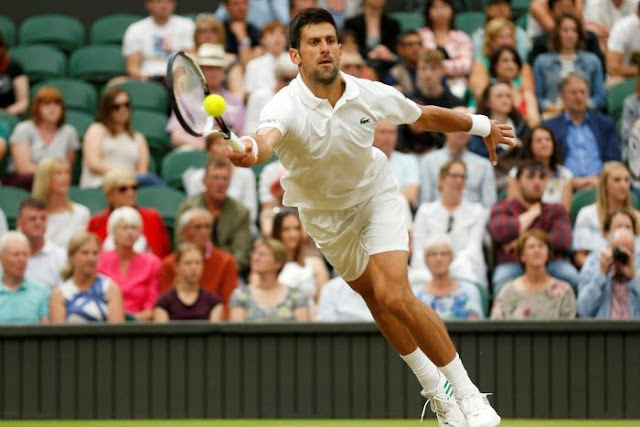 Djokovic’s departure leaves world No. 5 and seven-times champion Roger Federer as the highest remaining man in the draw following the loss earlier of top-seeded titleholder Andy Murray. Berdych will now play Roger Federer who marched into a record 12th Wimbledon semi-final with an authoritative victory over Milos Raonic. The winner of the Federer-Berdych match will clash in the final with either Marin Cilic or Sam Querrey, who downed an injured Andy Murray. Contesting his 100th match at the All England Club, Federer improved his record here to 89-11. The seven-time champion was elated after dispatching big-serving Raonic in just under two hours with 46 winners and only nine unforced errors. “I can’t believe it — 100 matches is a lot but I’m very happy my body kept me going all these years,” Federer said. “We had perfect weather and the crowd was into it. It was great and I’m so happy to be in another semi-final here. Federer, 35, is the second oldest man in the professional era behind Ken Rosewall to reach the semis here. Durable Rosewall was 39 and 246 days in 1974 en route to a hammering in the final from Jimmy Connors. Federer is into his 42nd grand slam semi-final, also a record, as he chases a 19th major. Head to head: Cilic 4-0, including 3-0 on grass.